The official lyric video for the song "Breathing Lightning" from ANTHRAX can be seen below. 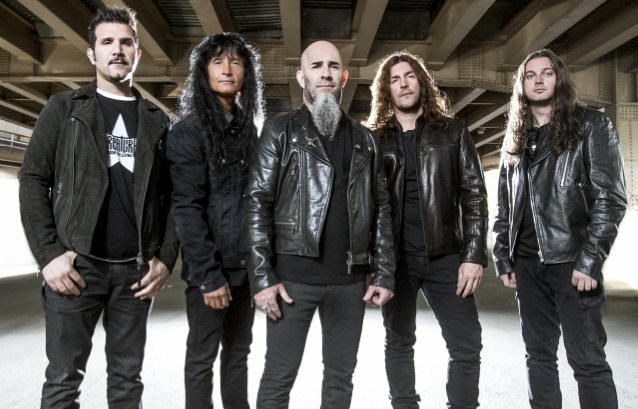 The track is taken from the band's long-awaited new album, "For All Kings", which will be released on February 26 via Nuclear Blast in Europe and Megaforce in the U.S.
Said ANTHRAX drummer Charlie Benante: "'Breathing Lightning' was a song that… I would call it more of an accessible song on the record. It just came out that way. I just had this really nice, pretty intro, and then it built into this song, and it has a really, really catchy chorus. So I like this song a lot. I can probably see this song being in our setlist a lot." Added ANTHRAX bassist Frank Bello: "You talk about 'Breathing Lightning', again, this is one of those big hooks. You just say, 'Wow, man! That should be the biggest song ANTHRAX has ever had.' It's got everything you want. The music's great. The hooks are just enormous in that song." Stated ANTHRAX guitarist and lyricist Scott Ian: "Lyrically, it's another song that was influenced by Stephen King. I hadn't been there in a while, I feel like, and Stephen King has been such a giant part of my life. His 'Dark Tower' series is… If I had to pick one thing that I love the most from him, it would be 'The Dark Tower' books, 'cause there's seven books, so I don't have to choose one. The character Roland, it's just something that stays with me a lot, this character from those books. So I kind of re-entered that world again. 'Cause I wrote ['Lone Justice'] way back when, on the 'Spreading The Disease' record, which was based on that character, and I decided to re-visit it, because, metaphorically, there's so many things you could use it for. But then I kind of wrap it up all in this giant ball of this Roland character from 'The Dark Tower' series, because I just love that world so much. So I'm kind of weaving in and out of reality and fantasy in that song. And 'Breathing Lightning', of course, is a metaphor for shooting." Pre-order "For All Kings" here. Beginning in the fall of 2014, ANTHRAX — Benante, Ian, Bello, Joey Belladonna (vocals), and lead guitarist Jon Donais — took their time in the studio recording the follow up to their Grammy-nominated, critically acclaimed 2011 album, "Worship Music". The band recorded some 20 original songs, almost twice as many as they had ever brought into the studio in the past.